Thanksgiving is a time for families and friends to gather around the table studded with specialty foods. The stuffed turkey usually takes center-stage. (One of my relatives, who shall remain nameless, serves lasagna instead of the 'bird'.) Then there are those wonderful - and some not so wonderful - side dishes and desserts - too many to name! As you plan your Thanksgiving menu, be sure to allow for leftovers. For instance, if mashed potatoes are to be served, make plenty so that you’ll have enough leftover to make Christine Datian’s Potato-Cheese Patties or one of her variations. Making sweet potatoes instead? Not a problem. Christine offers a variation using leftovers of those. Not making either kind of potato? She’s got you covered with a 3rd variation using zucchini or squash. Check out her recipe and variations below, and decide which you'll serve the day after. Place mashed potatoes in a large bowl; combine with the onions, garlic, eggs, cheese, flour, parsley, chilies, and spices, and mix thoroughly. Flour hands and form mixture into patties; roll in flour, bread crumbs or cornmeal, and chill for 30 minutes until firm. Flatten patties slightly and fry in butter or oil until golden brown on both sides. Drain on paper towels and serve immediately. 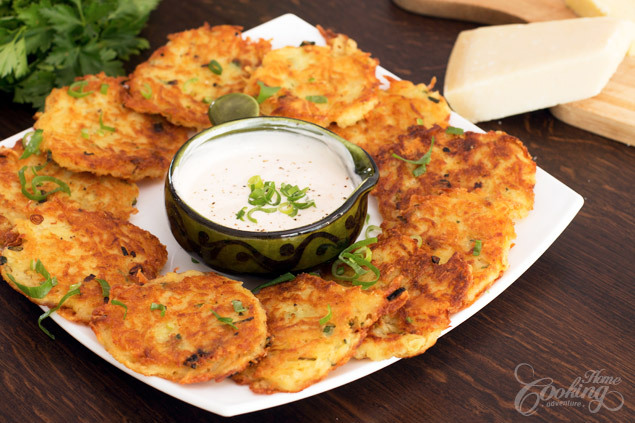 Garnish with sour cream, yogurt, hummus or chopped parsley, mint, and green onions. Serving Suggestion: Serve patties in pita pockets, topped with yogurt or hummus and thinly sliced red onions, radishes, and cucumbers or as a side dish or appetizer. Mashed sweet potatoes version: To the mashed sweet potatoes add 1/2 cup chopped raisins, dates or dried apricots and omit garlic, green chilies and parsley. Add 1/4 cup flaked coconut, 2 tablespoons maple syrup or honey, 1 tablespoon finely grated ginger, and 1/2 cup chopped walnuts, pecans or almonds. Flour hands and form mixture into patties; roll in flour, bread crumbs or cornmeal, and chill for 30 minutes until firm. Flatten patties slightly and fry in butter or oil until golden brown on both sides. Drain on paper towels, roll patties in cinnamon and sugar. Serve immediately. Garnish with chunky applesauce, cranberry sauce or sour cream, if desired. Zucchini/ Squash version (Baked): Patties may be made with 2 to 3 cups uncooked, unpeeled, shredded zucchini or squash, well drained. Add the grated onion, minced garlic, crumbled or shredded cheese (refer to above options), egg, flour (or bread crumbs) and parsley as listed above. (Omit green chilies) Season with salt, pepper, and paprika to taste. Shape into patties; chill 30 minutes. Coat patties in flour, bread crumbs or corn meal. Place patties on a baking sheet coated with cooking spray. Bake at 425° for 12 minutes. Carefully turn patties over and bake for an additional 12 minutes or until golden.